During National Survival Month, we encouraged readers to identify a task they hoped to accomplish. We were slammed with work that month and getting ready for vacation, so I picked an easy task that had been on my list – create a menu to be used during the first month of a serious emergency and gather the needed recipes. As I began the menu project, Phil reminded me that we had purchased a one-month food supply kit from Augason Farms . 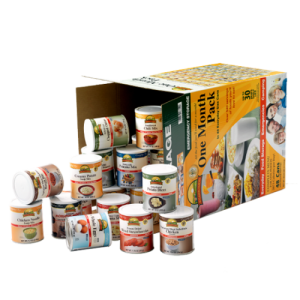 This kit contained 48 small cans of dehydrated and freeze dried ingredients and came with a recipe booklet with more than 50 recipes. Wow! Menu task accomplished! Well, not quite. But close. From that easily accomplished goal we decided that after returning from vacation we’d set aside a week during which we would make some of the recipes and get a more realistic idea of what it would be like to live off of our long-term storage food supply. Our original plan was to eat nothing but food from our long-term food storage, with a focus on the Augason Farms kit. After putting off our one week of survival food experiment several times, we realized that our original plan needed some tweaking. We realized that maintaining our normal schedule of work and ministry activities meant that it wasn’t practical for us to only eat survival food for that week. In an emergency, these commitments would be radically altered. We weren’t willing to make those adjustments for our experiment. Still, we were able to accomplish our goals by eating most meals from our long-term food storage while allowing the restaurant or fast food option when our schedule demanded. Yes, we know that we’re not practicing true survival. We’re not forcing ourselves into simulated hardship. Instead, we’re practicing with and sampling our survival food. I’m OK with that for this experiment. So what were our goals? Practice preparing the food. It’s never a good idea to wait until five minutes before you really need something to start learning how to use it. We want to practice preparing the food before we absolutely need to use it. Our one-month food kit is not a case of prepared entrees. It’s an ingredient-based kit that allows you to mix and match items to make a lot of recipes. There’s a big difference between reading the contents on the box and figuring out what you could make with it. Evaluate what’s missing from our food storage plan. When we start living on survival food, what will we be craving that we don’t have? It might be fresh fruits and vegetables, or meat, or desserts, or salty snacks. But until we start using what we have stored, we won’t know what is lacking. We need to fill in the gaps now. Evaluate portion sizes. Would their claimed “makes 2 servings” really make 2 real world servings? Share our findings with you. There is a lot of variety in the Augason Farms one-month pack . You can do a lot with it. In addition to their recipe booklet, there are also recipes printed on each can’s label. Being who I am, I put them all into a spreadsheet and created a weeks’ worth of menus. Without trying to sound like a commercial, it seems like I should give more info about the Augason Farms one-month pack . This pack is advertised as providing almost 2,100 calories per day for one person for one month. Nutritional information is provided on each can. The only absolutely necessary ingredient that isn’t provided is water. Some of the recipes in the included recipe book include ingredients that you may not have available (sour cream or hard cheese, for example), but most do not. Have you ever seen the cooking competition show called Chopped on the Food Network? Chefs are given a basket with four ingredients. Some of them are normal ingredients, some are very abnormal. The challenge is to make a tasty meal using all four ingredients, plus whatever else they have available. This kit is like playing Chopped. What kind of culinary wonders can you create with these ingredients and what’s in your pantry? These aren’t the jumbo #10 cans that you normally see for long-term storage food. Those big boys hold almost a gallon each. The food in this kit all comes in the smaller #2.5 cans which only hold about a quart. The smaller size makes it practical and affordable to sample a lot of products. Besides, the big #10 cans aren’t always your best choice for every type of food storage, as blogger The Survival Mom points out in this excellent article. The regular price of the kit is $256.99 (with free shipping as of this writing), but it is occasionally on sale. We paid at least $60 less for each of the packs we’ve purchased. (We purchased three kits at different times, so the price of each pack varied.) If you’re just getting started with prepping, or you’ve looked at the huge one-year food kits that many food storage vendors offer and found them to be way out of your budget or your prep plans, this one-month kit might be just the ticket for you. It’s way more affordable, takes up way less space, lets you sample a lot of products, and could be good as a starter pack for you or as a gift for someone else whom you wish was better prepared. At the regular price, assuming 3 meals/day for 30 days, the price per meal is less than $2.63. That seems pretty darn reasonable. At the prices we paid for our one-month packs, our cost went down to $2.18. And when the meals are stretched with rice or pasta, the price goes even lower. Of course one of our purposes in this experiment is to find the things we like most and purchase those items in larger cans at a better price. But considering the convenience of the smaller cans with menus provided, I’m a happy camper. It’s always a good idea to try before you buy. That’s especially true when it comes to long-term storage (LTS) food. Whether you buy the less expensive dehydrated food or the premium freeze-dried, LTS food isn’t cheap, and those who buy it tend to buy it in bulk. You buy it to eat when you don’t have anything else to eat, but that doesn’t mean that it’s OK for it to taste bad. Some people have the mindset that if they’re hungry enough, they’ll eat anything. Remember the line from the movie Crocodile Dundee: “Tastes like crap, but you can live on it.” That isn’t necessarily true. There is such a thing as “food fatigue.” Some people get so tired of eating something over and over again that they stop eating altogether. In a survival situation, that’s not a good thing. Your body is already stressed. You don’t need to add starvation to your list of problems. Fortunately, with many brands of LTS food you can buy sample packs or pouches to try a small quantity before you invest a big chunk of change. We recently took advantage of two such offers. One was from Wise Foods, one of the giants in the LTS food industry. Wise Foods is the most heavily advertised of any LTS brand that I’m aware of. Their commercials run over and over again on Doomsday Preppers. Their website has an offer for a free 4-serving sample of one of their entrées. They pick which one you get. Over the past couple of years, I’ve requested and received two samples from them. The other sample we tested was from eFoods Direct , a much smaller company that you probably have never heard of before. Neither had we until we started shopping for LTS food. eFoods Direct’s website offers a “free” six-meal sampler. I put free in quotes because they charge you $9.95 for shipping, but in their defense you get quite a lot for your ten bucks. They send you three 4-serving samples of entrées or dried soups, a food planning guide to help you determine how much food you need for the number of people and amount of time that you’re planning for, and a 30-minute audio CD (which is essentially a sales pitch). We decided to compare these two brands head-to-head one evening. We didn’t have the same entrée from both companies, but we hoped that by trying both brands at the same time we would get a feel for the quality of each. The product we sampled from Wise Foods was their Creamy Pasta and Vegetable Rotini. Sounds good to me. I like pasta and I especially enjoy having some veggies with my pasta. We matched it up against eFoods Direct’s Tortilla Soup mix. So how did they compare? Wise Foods, for all their advertising budget and celebrity endorsements, did not fare very well. Not at all. On the plus side, it was easy to prepare. Boil four cups of water, add the mix, stir it up, remove it from the heat, let it stand covered for 12-15 minutes, stirring occasionally. Easy peasy. The resulting dish had eye appeal, but that was all. Our first impression was that it really didn’t smell good at all. It just didn’t have a food product aroma to it. As for taste, it was salty (800 milligrams of sodium per one-cup serving), but otherwise bland and starchy. We gave their Creamy Pasta two stars out of a possible five. And that might have been generous. On to eFoods Direct’s Tortilla Soup. As I said, this was one of three 4-serving samples they provided. The other two are Creamy Potato Soup and Cheesy Chicken Rice. The rice dish would have been a more direct comparison against Wise’s Creamy Pasta, but we wanted a little variety. I’m a tortilla soup fan, so it’s not like we were comparing something we liked against something we didn’t. The Tortilla Soup instructions required bringing 4-1/2 cups of water to a boil, whisking in the mix, reducing the heat, and simmering it for 15-20 minutes. This preparation would take significantly more fuel in an emergency situation over the Wise Foods product, where you boiled the water but reconstituted the food with no heat at all. The energy advantage goes to Wise. But this was a taste test, so how did eFoods come out in that category. Let’s just start by saying that this is not a pretty soup. It was a reddish-gray color, about like a bowl of mashed kidney beans would look. So Wise beats eFoods in eye appeal, at least between these two very dissimilar dishes. As for aroma, the Tortilla Soup smelled just like you would expect tortilla soup to smell. You could tell what it was with your eyes closed. It was ringing my olfactory dinner bell. But the pleasant aroma didn’t fully prepare us for the flavor of the food. As good as it smelled, it tasted even better. This was restaurant-quality tortilla soup. It was very well seasoned, but not overly salty (451mg of sodium per one-cup serving) or what you would call spicy. One of the things that I liked best about this Tortilla Soup is that the flavor was well saturated. What I mean by that is that the next day I served some of the leftover soup over a bowl of rice and a relatively small amount of soup flavored the rice exquisitely. This is hugely important in an emergency food situation. Having something that flavors and stretches an inexpensive base like rice, pasta, or potatoes is an enormous plus. This takes the number of servings per pouch of the more expensive soup mix up and the cost per serving way down. Both Sandy and I loved eFoods Direct’s Tortilla Soup mix. We both gave it five stars. A week or two later we took a stab at their Creamy Potato Soup. It was also very good, about on par with a good store-bought dried potato soup mix from a company like Bear Creek. It didn’t ring our bell quite the way the Tortilla Soup did, though, but it still scored a solid four stars out of five. Not too shabby. We would never turn our noses up the Potato Soup. Aroma 0 Stars – Hold your nose! 5 Stars – Makes your mouth water! Taste 0 Stars – Too salty, bland & starchy 5 Stars – May I have some more, please? Like I mentioned near the start of this review, we received another sample from Wise Foods a couple of years ago. I don’t remember exactly what it was, but I would guess a Pasta Alfredo. It was just plain awful. Those who know me know that I’m not a picky eater – actually, I tend to be an adventurous eater. I’ve eaten from sidewalk food carts in Tiajuana, Mexico and lived to tell the story. That first sample we got from Wise was so bad that neither of us could eat it. Worse still, I gave it to our dog and even she wouldn’t eat it. There was nothing about it that told your body that it was a food product. I have an acquaintance who writes an excellent prepper blog. I won’t name the person or identify their website in this context because of what I’m about to say here. This blogger recently did a head-to-head comparison of LTS food from eight companies, all at the same time, using as close to identical entrées as possible. I would have loved to know who all eight companies were and how they ranked, but I didn’t want to press my luck with this person whom I know only slightly, so I just inquired about the winner and the loser. The winner was another small company that I haven’t tried yet — Food Insurance . The clear loser was (…wait for it…) Wise Foods. These results have placed your humble correspondents in a bit of a quandary. We run ads on this website with two goals in mind. First, we want to make it easy for our readers to find products that will help them get themselves and their families well equipped to face whatever emergency situation might come their way. I do a lot of reading and shopping so you don’t have to. We haven’t purchased from every vendor whose ads we run on this site, but we screen them all as carefully as we can for quality and value. We never want to give any of our readers a bum steer. That’s a great way to make someone a former reader. Our second goal with the ads is to make money. Both the missus and I spend many hours every week working on this website to make it a worthwhile resource for beginning preppers. We don’t get paid for it. The purpose for this website is to sound an alarm about the delicate condition of the world we live in. We are in danger from the threats of warfare, terrorism, the economy, and ecology. We are under a relentless cyber attack by our enemies and we could get sucker punched by a solar flare or a stray asteroid. How many times have you heard the phrase “the storm of the century” in the past few years? We really want you to be as well prepared as possible if any of these potential calamities becomes a reality in your neighborhood. But we can’t afford to do it for free, so we run ads on our website that pay us a small commission on each purchase that you make when you click through to the vendor’s site from ours. We’ve been running ads for Wise Foods on our site. They are a leading company in their field. They are one of the two best known players (along with Mountain House Foods) in their industry. A lot of people are buying Wise Foods for their LTS needs. So should we continue to run their ads because some people seem to like their product, even when we and the other blogger I mentioned can’t recommend them? I can’t do it. Even if I don’t personally endorse Wise’s products, running their ads still promotes them. I have nothing against the folks at Wise. They have been nothing but nice and helpful to me. But when it comes to a sizeable investment in LTS food, you can (and should!) do better than that. You can buy Wise through almost any other prepper site, but as of today you won’t be able to buy it through ours. I endorse eFoods Direct based upon my limited (but crazy tasty!) experience with them. FYI, I’ve also been very happy with the foods I’ve bought from Emergency Essentials and The Ready Store . Both of those are good, one-stop superstores for all things preparedness. But as of today, Wise Foods is gone from this site. In the words of one of my favorite foodies, I bid you good eating. Food Storage 101: What Types of Food Should I Store for an Emergency? Canned food provides the widest variety of types of food products. You can buy everything from soup to nuts in a can. I once heard that you can even buy beer in a can. There are a lot of heat-and-eat or ready-to-eat entrees in cans (this can be a critical factor in an emergency situation), or you can buy individual recipe components in cans and whip up your own concoction. Canned goods are familiar and readily available. One huge plus for canned food is that you almost never have to add water to prepare them. If anything, you’ll be draining water out of them, rather than adding it in. The downside with canned goods is their relatively short shelf-life, as compared to dehydrated or freeze-dried foods. Use it or lose it, baby. Although canned goods can be still be usable for years past their printed “best by” dates if stored in a cool location, those “best by” dates are often just one to three years out. People who base their food storage plan on canned goods need to practice rotation religiously. Other downsides to canned foods are their size and weight. You don’t find many backpackers who lug canned goods with them on mountain trails. In the same way they make for a poor option for bug-out bags. Canned goods are fine for being stored on a shelf in your basement or stashed under your bed, but if you need to pack up and go, canned goods are a major burden to bear. Dehydrated food is the best value among long-term storage (LTS) foods. As of this writing, Emergency Essentials, one of the leading vendors of emergency food and supplies, offers a 2,000-calorie-per day one-year food package for $1,300. By comparison, their 2,000-calorie freeze-dried kit sells for $4,500. (Let’s see — do I want three and a half years of dehydrated food, or one year’s worth of freeze-dried?) If you’re on a budget you’ll want dehydrated foods should rank pretty high in your long-term food storage plan. Long shelf-life is a huge advantage – many LTS dehydrated foods are rated at 20-25 years. The food you last today can safely stored for longer than you’ll live in your current house, most likely. Small storage footprint is also an advantage for dehydrated foods. Because the water’s been removed (and removed in such a way that reduces the size of the original product), they take up lots less shelf-space. You can fit a lot of food in a #10 can. That makes for the most compact storage option among the three types of food. Another factor with dehydrated food has both pluses and minuses. You won’t find many, if any, dehydrated food entrées. (Well, there are a number of dried soup mixes, but I don’t always count that as an entrée.) Instead you’ll find separate ingredients. The bad news is that this means that you have to cook. No “just add water” and have a meal. The good news is that you can cook anything you want, any way you want. You can add things to a ready-made entrée to customize it to your liking, but you can’t take anything away from it that you don’t like. I’ve always marveled at Taco Bell. They’ve got something like 30 items on the menu, but they’ve only got about five ingredients in the kitchen. It’s all just different combinations and preparations. Same thing with dehydrated food. You can make anything you want, but you’re the one who has to make it. I’ve always felt that the flexibility provided by dehydrated food gives it the greatest potential for assembling the healthiest meals. The most significant downside for dehydrated (and freeze-dried foods) is that they’ve been dehydrated — you have to have a supply of clean water to reconstitute them. When trouble comes, water may become a precious commodity. You need a minimum of a gallon per day, per person. That seems like a drop in the bucket now when the water is flowing freely. You leave the tap running while you brush your teeth. You throw a piece of tissue paper in the toilet and feel like you have to flush it. You take long showers. All of that goes by the wayside when water no longer flows from your faucets at will. So whether you’re bugging-out or bugging-in, the availability of clean water for re-hydrating these foods becomes an issue. Score one for canned food. Here’s another related downside to dehydrated food. Cooking them is energy intensive. Do you ever cook with dried beans? (If you don’t, you should start now.) They take forever to cook. You soak them overnight, but they still want to simmer in your crockpot all day or cook on the stove for a couple of hours. That’s what I mean by energy intensive. 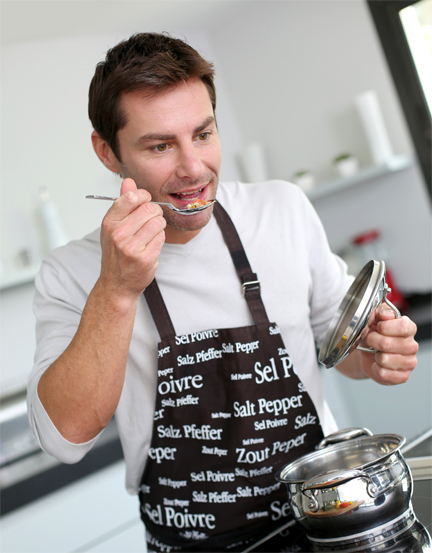 Besides having enough clean water, you also need to have a sufficient energy source to cook dehydrated food. Dehydrated food is the worst of the three types of food in this respect. I’ve already pulled this one into the discussion in the comparisons above, but more can (and will) be said about freeze-dried food. I pointed out that freeze-dried food is 350% more expensive than dehydrated. So why would anyone want to shell out that kind of money for it? Because it’s good. Almost all the best features that you want for long-term storage food can be found in freeze-dried. The freeze-drying process retains the appearance, texture, color, flavor, and aroma of the original food it comes from. By comparison, some dehydrated food gets shriveled, loses its fresh color, and can be a bit tough or chewy if you don’t cook it thoroughly. When you add water to freeze-dried food to reconstitute it, you can’t tell it from fresh. It’s also lightweight and portable. And there’s plenty of variety. Freeze-dried can take you places that dehydrated can only dream of. Dehydrated cheese? You have to settle for powder, like the packets that come with Kraft Macaroni & Cheese. You can make a cheesy sauce from it, but that’s it. With freeze-dried, you can have real shredded cheese. Or cottage cheese. Or blueberry cheesecake. 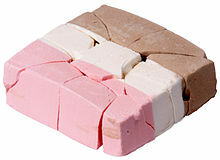 Or freeze-dried ice cream sandwiches. Starting to catch the vision? Freeze-dried fruits and veggies are very good, but one area where freeze-dried really shines is with just-add-water entrées. The leading brand of freeze-dried entrées is Mountain House. Their products are available from a lot of emergency supply vendors. They offer such family favorites as beef stew, beef stroganoff with noodles, pasta primavera, teriyaki chicken and rice, lasagna, and so forth. And it tastes good. Like real food. BTW, Mountain House has a sale twice a year. Watch this space and we’ll let you know when it’s happening. Freeze-dried meats are good, too. You can buy cans of diced chicken, turkey, beef, pork, or ham. (Yeah, I know ham is pork, but it’s different.) You can get crumbled sausage or ground beef. You can’t do that with dehydrated. The closest that dehydrated can come with meat and poultry is TVP (textured vegetable protein) made from soy beans and gussied up to vaguely resemble bits of meat. I’ve had some TVP that wasn’t bad, but I’ve had some that was. The freeze-dried stuff isn’t TVP. It’s the real deal. Like with dehydrated food, freeze-dried needs water to reconstitute it and energy to cook it, but it requires a lot less energy than most dehydrated food. For fruit, you just soak it in water. No heat required. For many entrées, you bring the needed amount of water to a boil, stir in the dry mix, cover it, and let it sit for 10 or 15 minutes, and presto! Hot and tasty food. The two biggest downsides to freeze-dried are cost and size. We addressed cost above. Freeze-drying doesn’t shrink the food, so it takes about the same amount of space as fresh, even though all the water has been removed. For example #10 (gallon-sized) can of sliced strawberries weighs only 7 ounces (less than half a pound), but it takes up a gallon of space. When reconstituted it provides more than 9 cups of sliced strawberries, but it takes up a lot of shelf space during storage. So what type should you buy and store? I’m not an “either/or” kind of guy. I’m much more of a “both/and” kind of guy. Why limit yourself to just one type when all three have certain advantages? I have canned goods on hand for short-term emergencies like a power outage after an ice storm. They would also make for good comfort food during a longer emergency. Freeze-dried can offer a lot of comfort food capability, but it’s also great for situations where you need mobility. Its light weight makes it a grab-and-go winner. On my budget, dehydrated foods make up the mainstay of my long-term storage food plan. For the best value, go with the big six-gallon pails of staples such as wheat, rice, dried beans, and oatmeal. (After you’ve opened a pail, you’ll need a plan for using it all within a reasonable amount of time to keep it from going bad, or have a way to reseal it for later.) Round out your collection with #10 cans of dried veggies and fruits, powdered milk, soup and sauce mixes. And store more than you think you’ll need for yourself and your family. When it’s crunch time, you’ll want to be able to reach out and help others who weren’t as well prepared as you are. Food Storage 101: What Types of Food Can I Store for an Emergency? There is a lot of confusion among prepper newbies about what types of food to store for emergency use. Canned? Freeze-dried? Dehydrated? Yeah, I can understand being confused. Been there – done that. To help sort this out, we need to look at the different types of food preservation available. You can’t develop a food storage plan that works best for you until you understand these basics. Canned vegetables, such as garbanzo beans, creamed corn, pickled beets, and sauerkraut. (Have I hit everyone’s favorites?) Also think tomatoes in all their forms (whole, diced, crushed, sauce, paste, juice). Some vegetables seem to can better than freeze. I don’t think I’ve ever seen a package of mushrooms or beets in the freezer at the grocery store. Beware of the sodium content in canned veggies. Then there are canned fruits, which include peaches, pears, fruit cocktail, and apple sauce. Don’t forget canned meats, like tuna, sardines, Vienna sausages (do they really count as a “meat” product? ), and the ubiquitous Spam. OK, some of those are fish, not meat, but you get the idea. For that matter, you can buy canned poultry, too, in a variety of sizes. If you shop at the right places you can get canned bacon, too, precooked and ready to rock, but I find it to be a bit spendy for my budget. Ready-to-eat canned entrees include things like beef stew, chili, soup, La Choy Chinese dinners, and everything that Chef Boyardee has ever made. That’s just hitting the high points of canned food. There are many others. I once bought a can of Pork Brains in Milk Gravy, just because I could. Let’s just say that you don’t want to be in a white elephant gift exchange with me. But I digress. The shelf life of store-bought canned foods varies a lot. In most cases it can be from one to three years. Meat and fish seem to have a longer “best by” date than fruits and vegetables. Almost everyone has found that canned foods are still good for long past the stated “best by” dated found on the cans, provided that the cans are not dented and are stored at a cool temperature. There is another broad category of canned food that we will cover extensively in an on-going series of blogs. This is home-canned food. Home-canned food that is properly prepared and stored can have a longer shelf life than store-bought canned goods, up to about 10 years. Watch this space for future blogs on do-it-yourself canning. We buy more of these than we’d think. If the instructions say “just add water,” it’s a dehydrated food. Common store-bought dehydrated foods includes rice, dried pasta, dried beans, dried soup mixes, meal kits like Hamburger Helper, and spices. But when preppers talk about dehydrated foods, more likely than not they mean the stuff from specialty vendors that comes in the big #10 cans (roughly one gallon) and is designed to have a shelf life of 20 years or more. These long-term storage (LTS) dehydrated foods include fruits, vegetables, grains, cereals, pasta, powdered milk and other drink mixes, sauce mixes, and baking supplies. As with canned foods, you can also dehydrate your own foods at home. More on this in a future blog. Freeze-dried is the new kid on the block. The process was invented during WWII to preserve medical serums that were being shipped to the troops. American astronauts were eating freeze-dried foods as early as Project Mercury in the early 1960s. Freeze-dried instant coffee was the first product that was available commercially. They’ve gotten really good at freeze-drying foods now. All the water is removed from the food while it is deeply frozen. The resulting product looks like the original, retaining the same general size, color, flavor, and smell, but is much lighter. When properly packaged and stored, freeze-dried foods can have a very long shelf-life. We’re talking 25 years here. Just about anything can be freeze-dried. For some foods (whole wheat, rice, pasta), dehydration works just as well and is much less expensive, so they don’t bother to offer everything in freeze-dried form. But you can buy long-term storage cans of freeze-dried vegetables, fruits, meats, and more. Anyone up for some yummy freeze-dried ice cream? My next blog will discuss the pros and cons of each of these different methods of food preservation and where they fit into your food storage plan. In the meantime, if this article has been helpful for you, we’d love for you to share it with a friend. Click on any of the buttons below.